Kezarah wrote: Wow!!! This is awesome!! I always take screenshots when I need a certain eb but I guess not anymore! Thank you so much for your time and effort to do this, chocolate  It's very much appreciated by all of us for sure! Thanks a lot, Kezarah! I'm glad you find it helpful! And you're welcome, I'm glad you appreciate my effort! The guide has been updated to include the newly released epic battle Ghomorax of the Highlands! The guide has been updated with the new epic battle The Labyrinth of Zoma. 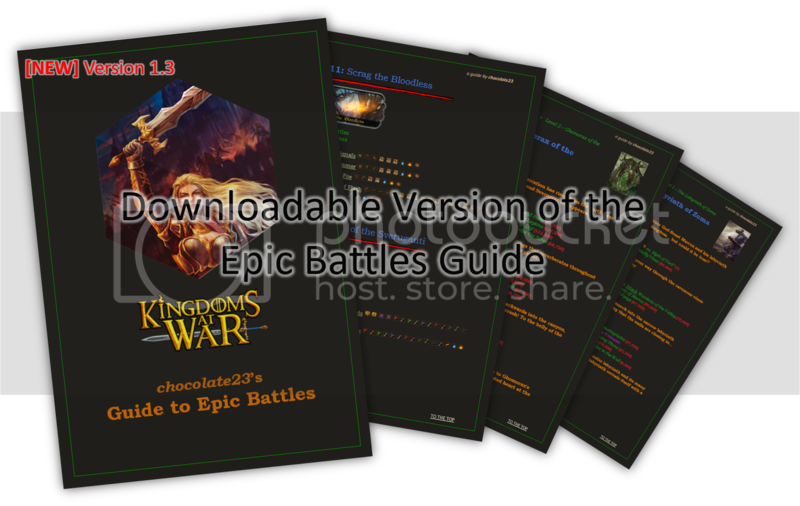 Version 1.3 of the downloadable Epic Battles Guide is now out! The guide has now got a brand new front page! The colors in the downloadable guide has been changed to match the colors that are in the guide on the KaW forums. Some small changes in the Labyrinth of Zoma epic battle. The guide has been updated to show that all epic battles drop the item Compass of Zoma. Some small bug fixes have been added. I need help. I'm on iOS, when I hold the download button no pop up for copy/open appears. And when I click on the download button it brings me to a blank page. Please help. Thanks. MikeWazowski430 wrote: I need help. I'm on iOS, when I hold the download button no pop up for copy/open appears. And when I click on the download button it brings me to a blank page. Please help. Thanks. Try to copy/paste this link into your browser: https://www.dropbox.com/s/73ppwfsbuvzd8 ... 3.pdf?dl=0. I hope it works! Worked perfectly, thanks! Great guide by the way! Lmao.. Kinda messed up the reply. But thanks, it works great.